For decades the The MIT Enterprise Forum, one of the preeminent organization of entrepreneurs in the global innovation economy, has been nurturing emerging technology startups into thriving businesses providing investors with prime investment opportunities. And for the past 80 years, 99% of Americans have been forbidden from investing in early stage, privately held companies, on the premise that such investments should be limited to the super wealthy. But today things are changing. Securities-based Crowdfunding, which is expected to begin in late 2014 or early 2015, will open up early stage investing to all Americans, giving them access to investment opportunities previously monopolized traditional venture capital and high net-worth investors. PeoplesVC, an equity-based Crowdfunding Company headquartered in Peterborough, New Hampshire, is democratizing Venture Capital and early stage investing, by creating a platform that will allow all Americans to access prized deals. Through a sponsorship with the MIT Enterprise Forum, PeoplesVC seeks to identify promising emerging high technology startups and help these companies raise capital from the general public. “I am excited about the prospect of opening up investment opportunities in promising high technology companies to all Americans,” commented Akhil Garland, CEO of PeoplesVC, Inc, “a new wave of capital formation is coming, and it is thrilling to help create new, meaningful jobs in our country,” Garland added. “I am delighted to welcome PeoplesVC as our newest partner in serving the needs of entrepreneurs and early stage privately held companies,” commented Lesa Lassard Pearson, Executive Director, MIT Enterprise Forum of Cambridge, “PeoplesVC will bring a new perspective to the MIT Enterprise Forum of Cambridge and I look forward to seeing how that perspective plays out in our community,” Pearson added. Peoples Venture Capital (Peoples VC) was founded to create American jobs by harnessing the power of the Internet and social networking and serving as a catalyst for rapid change, jobs growth, and innovation. The 2nd Annual Global Crowdfunding Convention and Bootcamp invites leading-edge Crowdfunding technology companies, Crowdfunding platforms and Crowdfunding campaign managers (Crowdfunders) to participate in the first ever Crowdfunding Expo Showcase to be held on October 14-16, 2013 at the M Resort and SPA in Las Vegas, Nevada. The trade show offers entrepreneurs the perfect opportunity to purchase an exhibit booth and begin to pitching their Crowdfunding business models to everyone in attendance as well as a virtual trade show booth for those that cannot attend in person. This is a must-attend event for all entrepreneurs, small business owners, investors, Crowdfunding professionals and advocates, enthusiasts, funding portals, investment bankers, financial advisers, venture capitalists, angel investors, incubators, business coaches, mentors, secondary stock specialists, equity financial analysts, and journalists. Attendees will be immersed in one of the most advanced Crowdfunding education systems on the planet that will include personalized hands-on access to Crowdfunding subject matter experts including legal, regulatory, financial, tax and technology experts. The 3-day event will also feature a one of a kind Crowdfunding portal pavilion as well as the industry’s first “Crowdfunding Expo Showcase” and “Crowdfunding Expo Marketplace” – where the industry’s experts will come together to exhibit some of the most advanced technology platforms, ancillary Crowdfunding Service Providers (CSPs) and some of the most innovative new Crowdfunding financial solutions in existence. 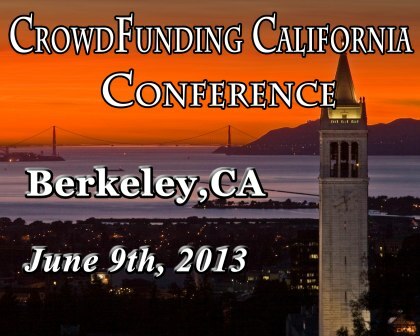 This event is the Crowdfunding industry’s premier event and space is limited. If you can only attend one Crowdfunding event this year do not pass this one up. Click here to register.